The official opening of Franklin Park in Van Wert will begin at 10 a.m. Saturday. The complex includes a pavilion, basketball and pickleball courts, a splash pad and playground equipment. A skate park is now open at Franklin Park in Van Wert. The Tony Hawk Foundation provided a $5,000 grant to help make the skate park possible. 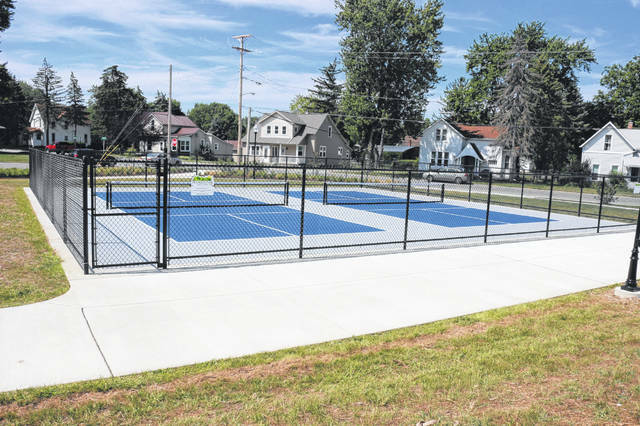 A double pickleball court is one of the features at Franklin Park. 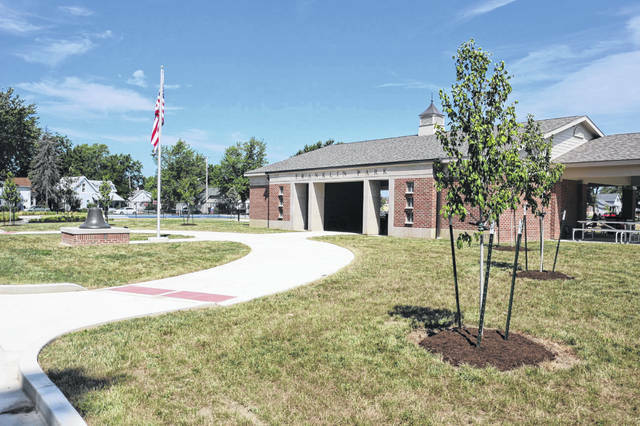 VAN WERT — The official opening of Franklin Park in Van Wert is scheduled for 10 a.m. Saturday. As part of that, officials will hold a ribbon-cutting ceremony and transfer the property to the city. Beginning at noon, there will be various free activities in the park. The $1.7 million complex was made possible through a partnership between the Van Wert County Foundation and Scott Niswonger, who invested seed money for the project. In 2013, when the former Franklin school was being torn down, Niswonger proposed putting a park on the soon-to-be empty lot. “He worked with then-Mayor Don Farmer at the time to say, ‘Yeah, we’ll do a park on that site,’ but no one really stepped up to the plate to oversee construction or to provide the remaining funding for that park — and certainly the city didn’t have the resources to do that. So about late 2014, Van Wert County Foundation knew of the project and said, ‘If not us, who?’ and said we’ll meet Scott halfway and do the park,” said Seth Baker, executive secretary of the Van Wert County Foundation. Niswonger, who went to Franklin Elementary School as a child, kicked in $250,000 plus the cost of designing the park. “He put in around $315,000 towards the project and the rest was funded by the Van Wert County Foundation. We’ve had some donors that have contributed along the way. The city kicked in $50,000, plus then also paid for curbs and new sidewalk ramps,” said Baker. The park includes a pavilion that was designed to resemble the former school. It can accommodate 100 people. “We’ve got a splash pad, that’s open pretty much dawn to dusk, a 2- to 5-year-old playground, a 5- to 12-year-old playground, double pickleball court, basketball court and a skateboard park,” said Baker. Baker was pleased with how the community cooperated in making the project a reality. “We took a chance and invested in a neighborhood of the community that really needed some investment and the goal was to create community investment, create excitement around that neighborhood. If we don’t invest in the neighborhood, the neighborhood continues to decline. If we invest in the neighborhood, people will take ownership of the neighborhood and property values should begin to climb in that neighborhood,” said Baker.